Virtually all types of juice -- from classic apple, orange and grape to juices made from peaches or vegetables -- contain natural organic acids. Each fruit and vegetable has a slightly different combination of acids, and each acid is associated with a different degree of tartness. While a few fruit juices are more acidic than others, many fruit juices share the same level of acidity, and vegetable juices have the lowest amount of acid. Most fruits and vegetables contain two, and often three or more, types of acids, with the two most common being citric acid and malic acid, reports Hawkins Watts, a food ingredients manufacturer. 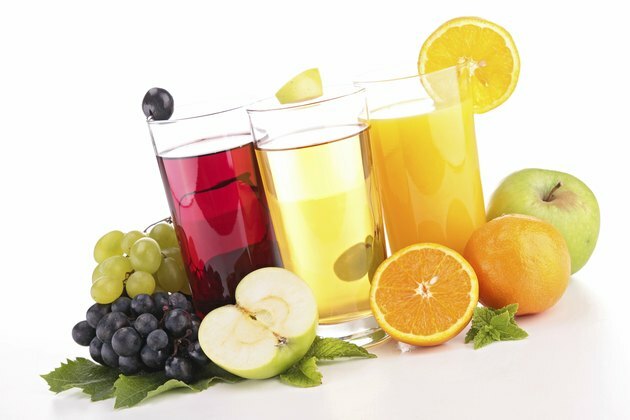 Natural fruit juice contains the same proportion of acids as the fruits they're made from, but some juices have extra acids added to enhance sourness and fruit flavors. Citrus fruits contain citric acid as their primary acid, while malic acid -- an acid with a less acidic taste than citric acid -- is predominant in apples, grapes, peaches, prunes, pears and bananas. Secondary acids include citric acid, malic acid and tartaric acid. The pH scale measures the level of acidity. Based on a range of zero to 14, a pH of 7 is neutral, while zero is the most acidic. The lower the pH score, the more acidic the juice. Juices made from cranberries, lemons and limes are the most acidic. They rate between 2 and 2.8 on the pH scale, which explains why they're so bitter that they need to be mixed with water and sweeteners. The fruits often used to make juice -- apples, oranges, pineapples, peaches, pears, strawberries and blueberries -- all have about the same level of acidity, with pH scores ranging from 3.3 to 4.6. If your juice includes some bananas, the acidity may be neutralized a little because their pH level is 4.5 to 5.2. Most vegetable juices are significantly less acidic than fruit juices, but their pH will vary depending on the mix of veggies and fruits used in the juice. Veggies commonly used to make green juices -- such as kale, spinach, cucumber, celery and parsley -- all have pH scores in the range of 5.5 to 6.8. Tomatoes are technically fruits, which is why the pH of tomato juice -- 4.1 to 4.9 -- is more acidic than other vegetable juices. One concern associated with all types of acidic foods and beverages is the potential for acids to permanently erode tooth enamel. Loss of tooth enamel occurs at a pH level of 4, according to the Minnesota Dental Association. While vegetable juices are safe, many juices made from fruits are in the pH range of 4 or lower. The Minnesota Dental Association notes that you can limit damage from acids by rinsing with water as soon as you finish drinking juice. You should also wait at least an hour before brushing your teeth or the brush will rub acids around and increase the risk of damage.